“We now have new permanent rainbow lights at the Ark Encounter so all can see that it is God’s rainbow, and He determines its meaning in Genesis 6.” Share this if you remember God’s promises to us! “This is Ken Ham’s sad attempt to take back the rainbow symbol from the LGBTQ community,” read a headline in the Orlando Weekly. 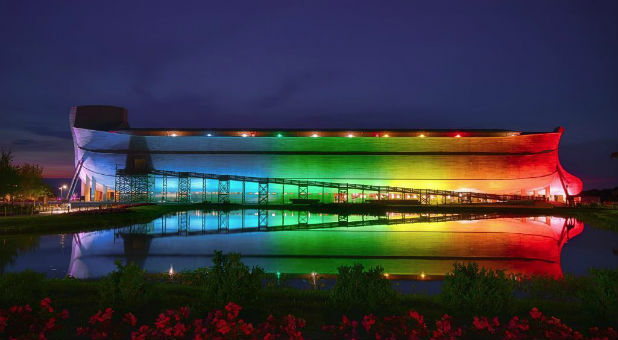 “It makes the ark look incredibly gay,” Kentucky Fairness Campaign’s Chris Hartman told USA Today. What strikes me about this Biblical theme park attraction is the symbolism of the ark itself in light of the convergence of End Times signs that we are witnessing. The ark symbolized God’s protection and method of delivering His people through the coming wrath. Today, once again, God is providing warnings that His wrath is about to be unleashed. Those who belong to Him will be protected and will be able to escape. If this was not true, then Jesus would not have instructed His followers to pray that might be ‘worthy’ to escape. His name is Yeshua, and His name means ‘Salvation’. So if you’re ever passing by Hebron, Kentucky, be sure to visit the Ark Encounter!